French Toast, Pain Perdu, or "Lost Bread." I have posted many variations of this dish in the past but not in quite a while. This is a favorite breakfast of my son who is home from college for the holiday. 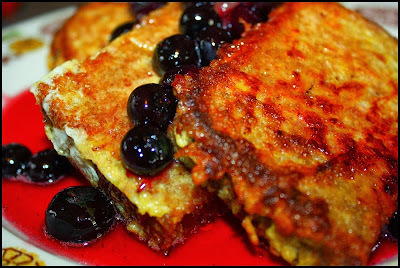 And this is the variation that I made for him today...whole wheat French toast with blueberry-pineapple syrup. This is really easy and fun to make and people will likely be impressed that you made everything--even the syrup--from scratch. Anyhow, for recipes, lore, and "how-to" photos follow this link (scroll down).